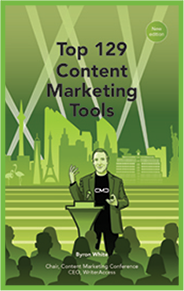 We wrote the book on content marketing tools. Now it’s yours for free. It’s a new era of marketing. Creating value through informational content that is relevant, interesting and useful is the driver for success. Arming yourself with the right tools is critical. Forward-thinking companies are joining the content marketing revolution -- gathering ideas, developing stories, and publishing a steady stream of content to engage readers and keep them coming back for more. Each tool is hand-picked and vetted for performance. We scoured the social sphere for user feedback and bundled it in a book that we hope will guide and enlighten you, while helping you select the best tools for your team.